Flushing is done to remove deposits of general dirt, salt precipitates and algae from the root zone, medium and other system parts. Pay particular attention to flushing the root zone and feed circuit. Inspect filters, inlets and feed outlets prior to replenishing the system with fresh nutrient. These are prone to becoming blocked with solid material dislodged during the flushing process. Flushing is done immediately after the nutrient is discarded. First, do any necessary manual cleaning, such as the removal of any obvious deposit build-up. Then partly fill the reservoir with fresh water and operate the pump to flush the feed circuit, medium and root zone. Flushing can be enhanced by spraying with a garden hose. Discard the waste, then repeat the process until the waste water is clear and its conductivity is equivalent to that of the make-up water. Although it is relatively common for hobbyists to flush only every 7-14 days, some commercial growers consider it necessary to flush daily. The frequency ultimately depends on factors such as salinity, temperature, medium, plant variety and general management practices. If flushing can be scheduled to occur when the nutrient reservoir is empty then the existing system hardware can be used. Place low alkalinity* water in the reservoir and operate the nutrient pump until the EC of the run-off water is no higher than ~0.5mS above that of the water in the reservoir. It can be a benefit to do additional flushing with a garden hose if the surface of the medium is readily accessible. 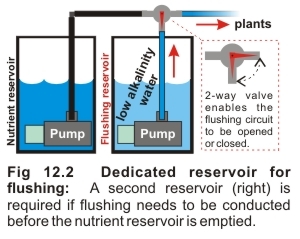 If the nutrient reservoir cannot be emptied to conduct flushing, it will be necessary to have another dedicated reservoir and pump for flushing (Fig 12.2). This can be connected to the existing feed circuit at a junction controlled by a 2-way valve. The valve is simply diverted to the second reservoir whenever flushing occurs. * Lower the pH of tap water to ~5.0. RO or rain water will not need adjusting.